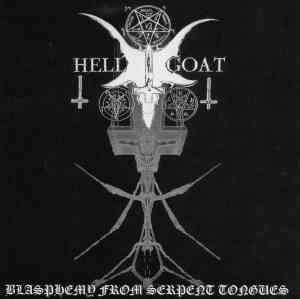 Hellgoat are a band from Georgia that h as had music reviewed by this zine and plays a very raw form of satanic black metal and this is a review of their 2005 album "Blasphemy From Serpent Tongues" which will be released in August by Boris Records. Ritualistic sounding keyboards start off the album along with some grim vocals a few seconds later which also leads to a very fast and raw musical direction which also uses a great amount of blast beats and tremolo picking as well as introducing high pitched black metal screams onto the recording. A great amount of war metal elements can be heard in the bands musical style along with a small amount of bestial growls and dark sounding melodies can also be heard at times along with the songs also bringing in a great mixture of slow, mid paced and fast parts and the music is very heavily rooted in the 90's and one track also adds in a brief use of war samples and spoken word parts are added onto the closing track. On this recording Hellgoat played a style of satanic black metal that was very raw and also mixed in elements of bestial and war metal to create a very blasphemous sounding album, the production sounds very dark and raw while the lyrics cover Satanism and Anti Christianity themes. In my opinion this was a very great sounding recording from Hellgoat and if you are a fan of raw and satanic black metal, you should check out this re-issue. RECOMMENDED TRACKS INCLUDE "Blasphemy From Serpent Tongues" "Reflection Of The Morning Star" and "Apocalyptic Prophecy". 8/5 out of 10.